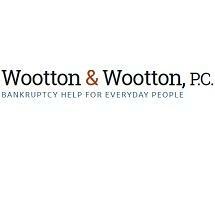 Wootton & Wootton, P.C., is a bankruptcy law firm with offices in Durham and Henderson, North Carolina. We have been focusing solely on bankruptcy law and real estate law for more than 15 years. Our lawyers are passionate about helping everyday people get out of debt and find a new sense of financial freedom. We're local. We’re not only your attorneys, but also your neighbors. All of our lawyers are natives of the Durham community. We're client-driven. Here, the attorneys you see in the commercials are the attorneys you get. We’ll work directly with you throughout your entire case, from start to finish. We only do consumer bankruptcy. We don’t represent creditors or dabble in other areas of law. Our sole focus is on helping people become debt-free. We make bankruptcy affordable. At our office, you can benefit from a free initial consultation, flat fees and no costs until filing. We also offer no money down for Chapter 13. With more than 40 years of combined experience, our attorneys can walk you through your options and help you decide whether bankruptcy is right for you. Learn more by calling our firm at 919-794-8660. We offer weekday and evening appointments for your convenience.